What is the etcom file? All data downloaded from the terminal into the TCMSv2 software is stored in the terminal data audit list and the etcom file. When the data is downloaded from the terminal, the data will go into the etcom file. Once the data is downloaded into the etcom file, the TCMSv2 software will then calculate the amount of data inside the etcom file to match the amount of data inside the terminal. If it tallies, the terminal will clear all the data inside the terminal. If the data does not tally, the software will prompt an error for the customer to check the terminal. The downloaded data will then be stored in the Terminal Data List of the TCMSv2 software. Using the downloaded data, users can then configure the Attendance sheet and view or print the Reports. The etcom file is located at c:\Program Files\FingerTec Worldwide\TCMSv2\etcom. After you have located the file, you will need to open the file with Notepad. The 25th digit “1” is for In and “0” is for out. The 28th digit is verify type, “0” is for password, “1” is for fingerprint. 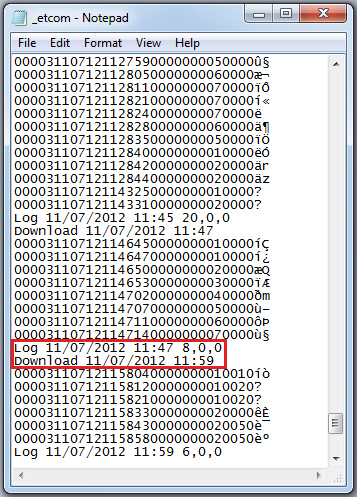 The etcom file will also display the data downloaded date and time. Besides that, it will also display the total amount of log transaction downloaded. Go to C:\\ Program Files > FingerTec Worldwide > TCMSv2 > etcom and copy the _etcom file. 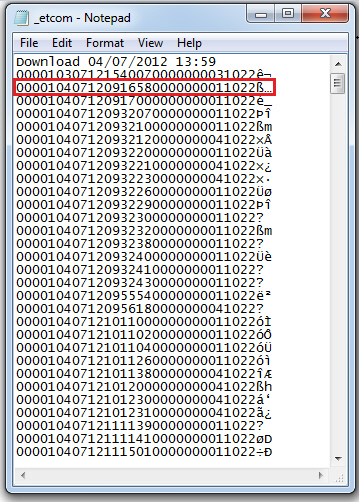 Then paste the _etcom file into the remote folder inside the TCMSv2 folder. Start up the TCMSv2 software, go to Attendance and click Download. The system will download the raw clocking data from the _etcom file. After the process is completed, the system will delete the file that you paste in the remote folder. If you accidentally downloaded the transaction data into another computer, you will need to merge the data into the TCMSv2 software. At the wrongly downloaded data computer, Go to C:\\ Program Files > FingerTec Worldwide > TCMSv2 > etcom and copy the _etcom file and store it to a USB pendrive. Transfer the _etcom file into the remote folder inside the TCMSv2 folder computer that you want to merge with. We have just successfully recovered the data of 2 days for a company having 635 employees. This article saved a lot of manual work for their Time Office. Yatin, good to know this write up helps you and your customer. We have installed Fingertec AC100C attendance machine. We would like to update the attendance automatically into our ERP system. Is this possible ? Currently, we follow the procedure of "Setting duration" and "Exporting to Excel" and then "Upload the Excel file into our ERP software module". Please inform us of any possible automatic feature i.e. non-manual synchronising feature. Regards. The automatic export function only available with raw clocking data from the terminal data audit list. this feature not workable for version 2.2 and above according to your support team. Hello can you help me ?in my pc A can show all activity of my staff but my pc B can not do and I have asked the technical fingertec ready and they told me to merge the etom file so please tell me how I merge the clocking data at the PC B with the main PC by using the etcom file. -At the wrongly downloaded data computer, Go to C:\\ Program Files > FingerTec Worldwide > TCMSv2 > etcom and copy the _etcom.15 file and store it to a USB pendrive. -Transfer the _etcom file into the "remote" folder inside the TCMSv2 folder computer that you want to merge with. -Start up the TCMSv2 software, go to Attendance and click Download. -The system will download the raw clocking data from the _etcom file. -After the process is completed, the system will delete the file that you paste in the remote folder. With regards to your query, please advise what is the error that you have received when you want to download the attendance data. Kindly send the screenshot of the error to support@fingertec.com and explain in details regarding your problem.